Why Are There So Many____? I call a perceptive reader in Chicago an old friend even though he is more than a decade away from the 75 I marked last Friday. For over thirty years we have had more or less monthly Sunday morning telephone chats of some length about matters both political and personal. I often use his suggestions for topics in the WIR. But I have so far neglected one he has raised more than once—in addition to big overarching issues like climate change, war, and human rights we should also note the increasing difficulties in ordinary daily life of working people. A headline over a useful article in the Tuesday New York Times read–Tax Plan’s Biggest Cuts Could Be in Living Standards. A story on the Monthly Review site examines A Grim Picture of Working Class Finances. Another friend in Los Angeles who I came to know through our efforts in the old Labor Party Advocates, and who has been a diligent supporter of the KC Labor project since we went online nearly eighteen years ago, also contributes ideas for stories. A few days ago she sent me a Guardian link that might have been ignored by algorithms searching for class and climate topics—Why Are America’s Farmers Killing Themselves In Record Numbers? Of course, farmers are not part of the same class as wage workers. Some are rich and exploit farm workers–and identify with the capitalist class. They are not the suicidal ones. But those who actually work their land are fellow toilers who can and should be allies of the working class in fighting for justice for both. The working farmers are being shafted by the AgriBusiness complex and the banks as well as being at the mercy of weather and nonhuman pests. And in the midst of “prosperity” many of them cannot keep up. Blaming themselves, some fall in to despair. In my opinion, that is the principal reason why so many farmers are killing themselves—more than any other occupational group, more than even homeless veterans suffering from PTS. This deadly crisis for American farmers has been exported through Globalization resulting in even more alarming numbers in other countries. Agricultural suicides average one a week in Britain, every four days in Australia, every two days in France. In India, more than 270,000 farmers have taken their own lives since record keeping began in 1995. These deaths should not be chalked up to personal failures. It is cruel to brand them as committing the one unforgivable sin, as some religions do. Culpability for their demise mostly belongs to capitalist greed. We can save lives by helping working farmers understand their plight is caused by the system, not their incompetence. We can also offer hope for the future. With our solidarity, workers and working farmers united can create a new, just system. I plan to deal more often in the WIR with such problems of every day life. While I strive to be better than they are, it’s difficult to suppress a feeling of comeuppance when the one percent get punished for their luxurious indulgences. The current round of wild fires in southern California inflicted some damage in Los Angeles suburbs with mansions of the rich and famous–even when protected by their own private fire brigades. One “tragedy” in particular caught my attention. Rupert Murdoch built a chain of Australian newspapers he inherited from his knighted father in to a global multimedia empire. In addition to being a reactionary, union-busting, misogynist he is a dyed-in-the-wool climate change denier, denouncing it as “alarmist nonsense”–and that line is fed to tens of millions of readers and viewers every day. Since becoming a naturalized U.S. citizen in 1985 Murdoch has maintained homes in both Britain and America. He doesn’t have a residence in tony Bel-Air but he does own a winery there he purchased after reading it was for sale in the pages of his Wall Street Journal. Murdoch’s winemaker earlier this year claimed climate change was actually enhancing their sauvignon blanc. But sadly last week the Guardian ran a story, Rupert Murdoch’s winery scorched as California wildfire rips through Bel-Air. But we shouldn’t let any guilty pleasure about seeing “what goes around comes around” divert our attention to the very real tragedies of loss of life and homes of all classes. We need to determine their cause and develop a remedial response. The media attributes most of the blame on fierce desert Santa Ana winds being squeezed through passes in the mountains overlooking Los Angeles. While their force is palpable they are symptomatic, not causal. Those winds have arrived with seasonal regularity since long before any humans arrived in present day SoCal without such catastrophic effect. Nor do they explain other less publicized outbreaks of wildfires throughout the western U.S. and Canada that haven’t yet menaced major population centers. I don’t think it is alarmist to sound an alarm about a clear and present danger. NASA is one government agency Trump has not yet been able to silence. A recently released chart clearly shows the steep rise in carbon emissions in the greenhouse zone of the atmosphere continues threatening even more disastrous newer normals. Governor Brown is projecting himself as the American leader of the movement to stop overheating our planet. But he is the second generation of a political family that played a prominent role over the past several decades in shaping ecologically destructive policies that promoted urban sprawl, car dependency, and ubiquitous oil wells even in metropolitan areas. Even today, while vowing to continue Obama’s cap-and-trade Clean Power Policy repudiated by Trump, Brown is giving his blessing to new fracking ventures in California. But all is not yet hopeless. I had an opportunity to join an online national conference call of the Labor Network for Sustainability last week. The participants and agenda confirmed some progress is being registered in building a working class component of the climate movement. 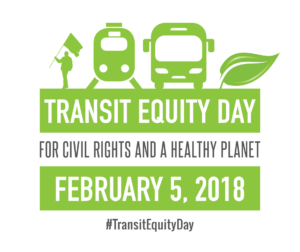 A major project near and dear to me is a nationally coordinated Transit Equity Day February 5. The WIR will provide more details as they become available. * After a week-long strike by 2,000 members of SEIU Local 1021, whose picket lines were honored by a thousand other unionists, the city of Oakland, California agreed to mediation efforts to resolve their contract dispute. Their contract expired June 30. Wages are the big issue in one of the highest cost of living areas in the country. The union is seeking a 2 year contract with 4 percent raises each year. In their last offer management accepted 4 in the first year but only 1 in the second. * The management Railway Age reports a tentative agreement has been reached in the second of three national contract negotiations with rail craft unions. While no details are specified it purportedly mirrors the first settlement that included union give-backs on health care. More resistance is expected in the final deal being negotiated with the Brotherhood of Maintenance of Way Employees in the lead of crafts representing 20 percent of unionized rail workers.